Mingo UTI Prevention Drink Mix is your ultimate UTI defense. Professionally formulated by scientists, doctors, and UTI sufferers to deliver a therapeutic dose of D-mannose whenever and wherever you need it. Recommended Dose & Use: For Adults: Pour, mix and drink. 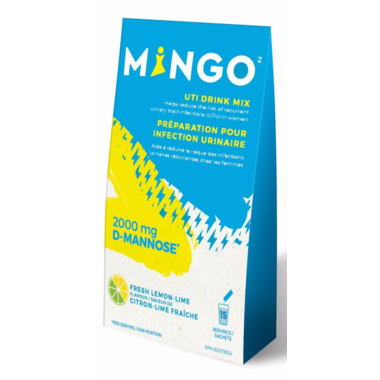 Tear open and dissolve 1 packet of Mingo drink mix in 500 mL water. Take 1 serving of Mingo 1-2 times per day per day to help reduce the risk of recurrent urinary tract infections (UTIs) in women. Ensure to drink enough fluids. Vitamine B6 (Pyridoxine Hydrochloride/Chlorhydrate De Pyrdoxine) 10 Mg.
Citron-Citron), Stevia (Stévia), Silica (Silice). Non-Medical Ingredients: Beta-Carotene (Bêta-Carotène), Natural Lemon-Lime Flavour (Saveur Naturelle De Citron-Citron), Stevia (Stévia), Silica (Silice). Cautions: Consult a healthcare practitioner if symptoms persist or worsen or if you have more than just mild symptoms - such as painful urination, blood in urine, side pain, fever, chills, nausea and/or vomiting. Consult a healthcare practitioner prior to use if you have heart disease, kidney disease, high blood pressure or diabetes, if you are taking medications, particularly ACE inhibitors, diuretics or cyclosporine, or if you have other underlying or ongoing health concerns. Very sweet drink but tastes good. A bit expensive.